LOS ANGELES, CA - APA Los Angeles is excited to announce the seventh annual Off The Clock curated exhibit of inspired personal photography. 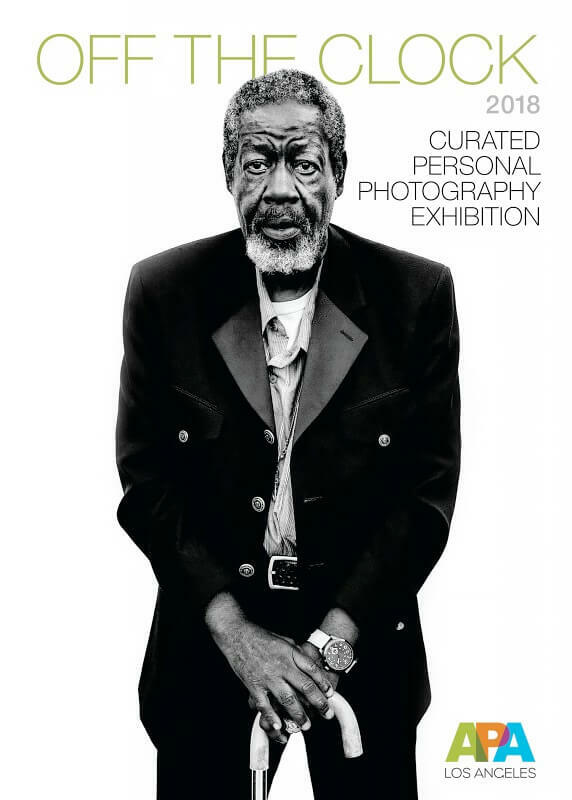 The exhibition is comprised of one hundred selected images. Please join us in celebrating these artist. Lauri Kratochvil is this year’s OFF THE CLOCK curator. Ms. Kratochvil applied her unique vision in carefully selecting her top one hundred images from nearly one thousand submissions. April 21, 2018 those selected images will be on exhibit at the Off The Clock Gala and Exhibition. Abdul Smith, Amparo Barajas, AnnaMaria Zunino Noellert, Art Streiber, Augusta Sagnelli, Beverly Houwing, Bill Moree, Bill Rush, Bret Doss, Carsten Steinhausen, Chris Cardoza, Christa Mae Holmes, Christina Gandolfo, Coral von Zumwalt, Dana Hursey, Daniel Bergeron, D.A. Wagner, David Westphal, Dominic DiSaia, Doug Birnbaum, Drew Endicott, Elizabeth Panzer, Elizabeth Panzer, Eric Lawton, Erin Derby, Fernando Decillis, Forrest Pittard, Frank Ockenfels 3, Gary Salter, Geoff Johnson, Grace Chon, Hannah Benet, Hemali Acharya Zaveri, Ignacio Umana, Jacob Watts, James Kao, Jens Lucking, John Aitken, John E. Kelly, Judy Doherty, Ken Locker, Kremer Johnson, Leonid and Tatiana, Liam Sharp, Little Outdoor Giants, Louise Pedneault, Marcela Ferri, Mark Edward Harris, Markku Lahdesmaki, Mary Edgecomb, Matthew Barnes, Maureen Haldeman, Michael Mayo, Michael Schoenfeld, Michael Stearns, Michael Sugrue, Michel Leroy, Michele Palazzo, Mickey Strider, Nader Khouri, Nicholas Fedak II, Patricia Fortlage, Paul Turang, Peter Adams, Raymond Graber, Rebecca Moseman, Reza Nabavi, Rich Frishman, Robert Meyers-Lussier, Robert Ripps, Seth Joel, Stan Musilek, Stella Kalinina, Steve Condiotti, Timothy Griffith, Tom Stahl, Tyler Darden, Vincent Ricardel, Wenying Liu, Wray Sinclair. This Year APA Los Angeles and Month of Photography Los Angeles (MOPLA) will share Opening Night exhibits on April 21 at Santa Monica Art Studios.